What exactly do you get the nerd who already has everything? That’s definitely something to start thinking about now for Christmas and this amazing globe of the planet Mars by Planetenkugel-Manufaktur (the website is thankfully simply marsglobes.com) may well do the trick. 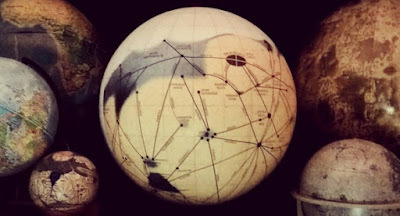 It is based on the famous map of Mars by astronomer Percival Lowell (1905). This lovely film gives a glimpse into the world of Dr Michael M Plichta, the Mars globemaker. He also gives an insight in to the process of making a Mars globe and like any expert makes it look very easy. I can’t even put up wallpaper without making a complete mess of it so I can assure you that when he says it needs a lot of training he isn’t exaggerating. As an aside, I wonder just how many people in the world have globemaker as their profession on their passport.